Are you on the wrong career path? A DISC assessment can help you decide. In stark contrast, studies indicate that people who do have the opportunity to focus on their strengths every day are six times as likely to be engaged in their jobs and more than three times as likely to report having an excellent quality of life in general. Human beings are resourceful and determined creatures. Most of us can accomplish whatever we set out to do. But why not identify what we are great at, and develop those strengths? Why waste years in a job that we can certainly do, but hate? Why not point your career towards jobs that play to your strengths? The DISC assessment is designed to provide insight into what your strengths are. Once you have identified those strengths, the smart money will double down on them. A Brief Explanation of DISC Personality Types Dr. William Moulton Marston was the creator of DISC Theory at Harvard University in the 1920’s while doing research for his book The Emotions of Normal People. He was looking to identify predictable traits and behaviors of everyday people in different environments. DISC styles are a combination of four behavioral personality types. These styles are not black and white. We have some level of each of these styles in our personality. It’s just a matter of what combinations are high or low. A high level of dominance predicts our behavior in the same way a low level of dominance does, so intensity does matter. 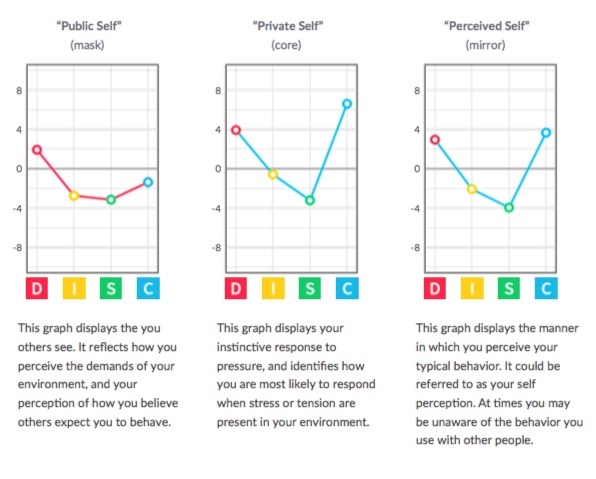 When analyzing a person’s personality style, we look at which combinations are highest; also taking into account how high or low each style is on the graphs. By taking the DISC evaluation and looking at one’s primary, secondary, tertiary and even absent style traits, we are able to determine one’s DISC personality type and how they will act, react, communicate, handle conflict, and even organize a project or workspace in a given environment. Purchase an evaluation for yourself. Complete the process below. Once you pay, someone in our office will email a code for you to take the DISC. It’s a manual process, so it will likely happen during business hours. Styles commonly are different in the home environment, in a social environment, and in a work environment. This information can be very powerful when used in hiring the right person for a position, increasing communication between teams and individuals, training managers and leaders, and many more DISC applications. By understanding one’s needs, fears, and tendencies in communication and behavior, you can proactively adapt or approach them in a way in which they will react positively. People are all different, but people are predictably different.